About a month ago, I saw a tweet on Twitter referring to BreakoutEDU. I opened the link to the blog post and was instantly intrigued. The BreakoutEDU website was blocked by our school, so I had to use my cell phone to look at the site. If you don’t sign up to be a beta tester, there isn’t much to see on the website other than an intro video and the supplies you would need to create your own breakout, if you don’t want to purchase their kit. I signed up so that I could get the password to the games. As soon as I had the chance, I went to my AP to share my enthusiasm with him regarding this new thing that I was going to try. 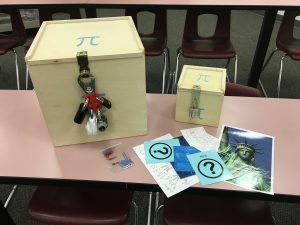 Unlike the BreakoutEDU kit, I really wanted multiple boxes so that instead of having all clues out in the open, students would have to open a box to get a clue to another box, ultimately opening all the boxes and breaking out. I also knew that I wanted the boxes to nest for easy storage. 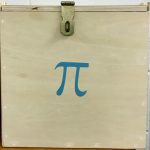 I knew that I could get my dad to make these boxes for me. I let my dad in on my idea, and he delivered. 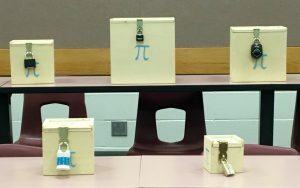 I now have four sets of breakout boxes, each with five nesting boxes. I need a UV flashlight. 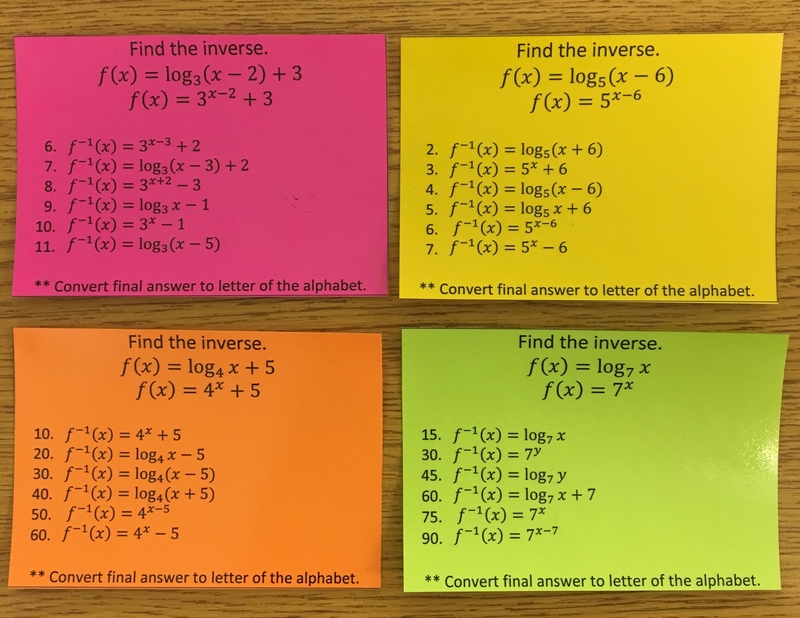 A few of the classes paid attention to these little notes and asked about them. Some days I would change the lock that was on the outside of the box, or put the large hasp on the box with all the locks. About a week before we were schedule to go play our game, I un-nested the two sets of boxes that were in my room. The Saturday before we were schedule to go play our game, I brought up one more set of boxes. Now I really had their attention. Where were all these boxes coming from? Since it is the end of the school year, I decided to create my own game for our first breakout. I made a game that would review concepts for the spring semester exam. 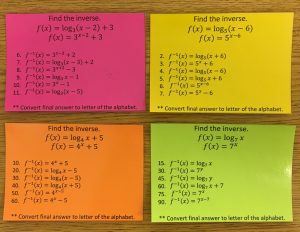 The topics included transformations of parent functions, simplifying expressions (exponent rules and radicals), solving equations (radical and logarithmic), and rationals (properties of their graph, simplifying, and solving). 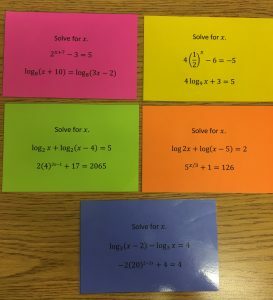 Students were given 45 minutes and two hint cards. We went to the lecture hall to play our first game on May 24. The classes were divided into three groups each. I started the timer, and let them go. Every group used one of their hint cards to get them started. After they had the first box open, there was no stopping them. 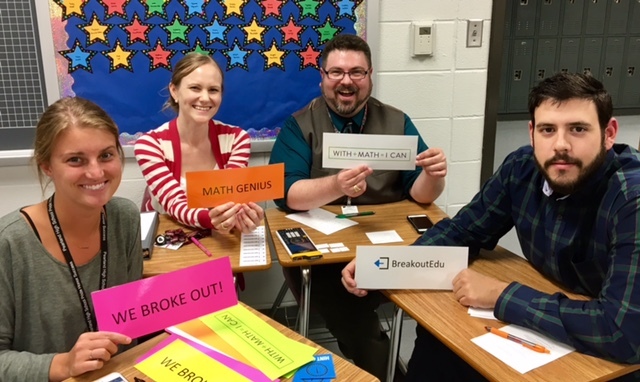 Every group, in every period, broke out! Unfortunately, I didn’t get a video of any group opening their last box, but we did take pictures once they had opened their last box. They also got a sticker for their success. Believe it or not, high school students will do anything for a sticker. The following day we did another breakout. 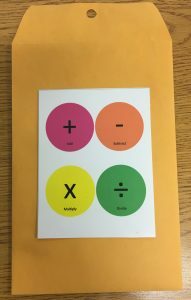 This time I used Dr. Johnson’s Lab from the BreakoutEDU website. The setup only uses two boxes. 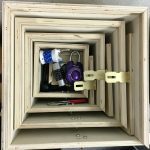 The big box has a hasp on it that can hold up to six locks. I only have two hasp, so we did boys versus girls. I have mostly girls in all my classes, except for 5th period, which is pretty close to 50/50. However, more heads did not lead to the girls breaking out faster than the boys. Except for first period, the boys broke out before the girls. Feedback from the students was that they really enjoyed the breakouts. 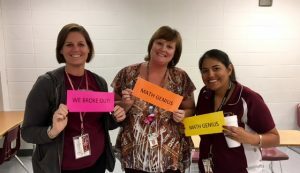 This entry was posted in PAPA2 and tagged BreakoutEDU on May 27, 2016 by Jennie Kelly.